Farming has been a tradition in the Pauling family for generations. “When my dad and uncle were thinking of retiring, they asked if my brother and I would take over the farm” says Bill. “We both enjoyed farming, so we said yes.” Today, Bill and his brother, Larry, are the third generation to run their farming operation, Pauling Bros. With the help of Bill’s sons and brother, Joe, the family grows corn, soybeans, winter wheat, oats, and hay. They also raise beef cattle and chickens. 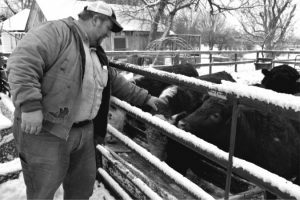 Bill is always striving to make sure that the consumers get the best possible products from his farm. “Our chickens are kept in large open cages where they are free to roam and roost. We feed them corn and wheat that we raise on the farm, and protein feed. We also feed our cattle protein feed, hay and corn that we grow ourselves, and we bed them to keep them comfortable” he states. Before crop production each year, Bill chooses the seed that best fits his land. During the growing season, he monitors weeds and decides if chemical intervention is needed. Once the crop is harvested, he dries the product to prevent it from spoiling. In addition to farming, Bill is the Secretary/Treasurer for the Kane DuPage Soil and Water Conservation District. “Farmers always have conservation in mind” he says. “If we don’t use conservation practices with our soil, the fertility is lost.” Bill uses a conservation technique called No-Till. In this process, farmers minimize the disturbance of their soil by not tilling their fields before planting. This reduces soil erosion, fertilizer runoff, and controls water runoff.